Dr. Michael White is the subject of the cover story in the August 2008 issue of OffBEAT Magazine. 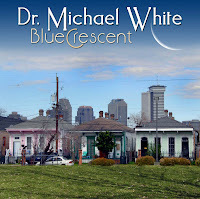 Dr. White just released Blue Crescent on Basin Street Records. Dr. White will be performing on August 3rd at the Satchmo Summerfest in New Orleans and later in August will be performing at the Bourbon Street Music Club in Sao Paulo, Brazil. In September he will perform in Washington, DC during the festivities where he will be recognized by the NEA as a recipient of the National Heritage Fellowship awards.